Leer el artículo en castellano. No place can inspire incredible stories quite like Galicia. And we are not saying this only because we were born and bred here, but because we truly think it is true. Our homeland is a paradise on earth like no other and if you have not visited it yet, it is about time. Let us tell you a few things about this Southern Galician city and its surroundings. You will soon uncover why we are this excited to share this well-kept secret with you. Welcome to Vigo. An industrial yet beautiful city in the Pontevedra province, in the South West of Galicia – and just a mere 30 min away from Portugal! – that will make you fall in love with this land if you haven’t already. Not only Vigo enjoys a mild weather year round due to its seaside location but it is also full of surprises and has a unique urban scene worth diving into. Before your arrival, check the events and music festivals going on, there is always something like the dance show we got to witness a few weeks back, where a few dance groups got to show their moves in front of a casual audience, at one of the main squares. From jet skiing to canoeing, swimming, snorkeling, windsurfing or flyboarding; the list of watersports available to enjoy Vigo’s estuary is long and fun. We got to try our hand at flyboarding with the guys at Tierra y Mar and, skeptical as we were before starting, all the group stood up and flew a few meters above the water surface. Très cool. As the Banyen Thai Urban Spa, where you can enjoy a range of treatments and massages that would put many other spas to shame. I chose a Thai one – pretty traditional – but my colleagues got some exotic massages. Simply all you need after a few falls trying flyboarding or if you want to relax and pamper yourself a bit. After all, you are here to enjoy! Spain streets are usually alive, especially in Summer. And Vigo has its own share of squares and meeting places that get busy at sunset. People gather around a few drinks both inside the many bars and outside even if the sun left. It is the perfect time to unwind and meet new people or just enjoy a sundowner or beer – the drink of choice at this time. La Consentida or Lume de Carozo are just two places where to get started, but there are tons of tascas and restaurants that will help you understand why us Galicians need to go for some tapas a few times per week. Small portions of food, as you already knew, tapas are usually paired with a good wine and better company. Some spots are so busy that you will need to eat standing, but don’t let that issue to ruin your experience. Tapas are the freaking best! Take it from someone that knows what she’s writing about. Why did I not include sailing along with the other water sports in number 2? Well, this one deserves a spot on its own. 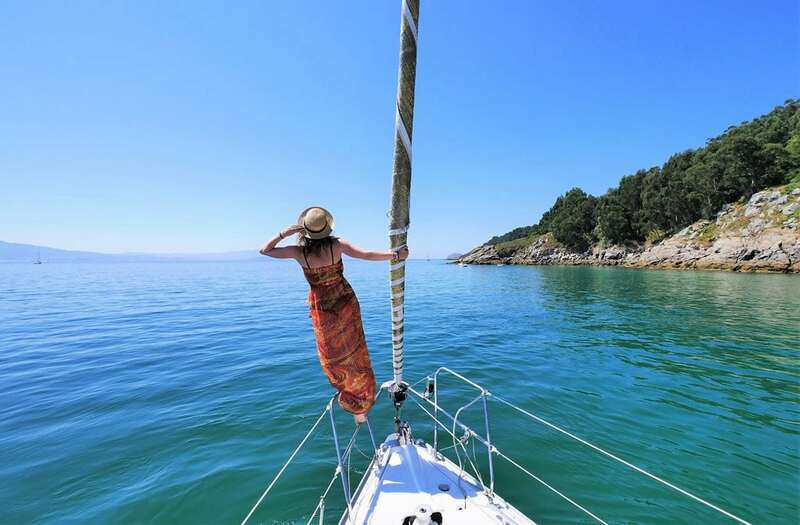 Sailing is the quintessential thing to do in the Vigo estuary and one that everyone should try at least once. Whether you come with a group of friends or on your own, there are lots of companies ready to take you for a few hours and even days around Vigo and Cies Islands. Do not forget to bring some food and drinks with you. El Bandoneón is a great choice if you are looking for delicious dishes easy to take on board. I can’t stress enough how great this experience is, so I will just say sailing is my favorite thing to do in Vigo. Along with Ons islands a few other little ones, Cies Islands are part of the Marine National Park of the Atlantic Islands. And we as Galicians could not be more proud of them. Many times highlighted as some of the best islands in the world by authority newspapers and big travel magazines, Vigo’s estuary has two guarding its entrance: the most touristy one – aka. the one where Rodas Beach is – and the South Island, only accessible by private yacht. Have a look, you are missing out! From pulpo á feira to navajas and lots more dishes in between, Galician gastronomy is one of a kind. People travel across the world to taste our yummy – and affordable – seafood and we totally get why. Marina Davila. Carefully designed dishes and upscale atmosphere by Vigo’s port. A Chabola. Down-to-earth tasty Galician food with a twist. Feeling like dancing to mainstream tunes among ‘gente guapa’ – beautiful people? Head to Arenal. More of a rock buff? Then Churruca is your area. On the mood for live music? The Hush Rock is waiting for you! Whatever you choose, we warn you: do not schedule anything early next morning. Vigo is as canalla – night beast – as it gets! For a perfect closing, and if you aren’t afraid of heights, talk to the people at Aerocelta about arranging a flying experience over Vigo and Cies Islands. We flew a Cessna 172 – pilot, co-pilot (me! ), and two passengers – and it resulted to be an excellent way to wrap up our time in Vigo. Sept 1st, 2017 Update: The winner, randomly picked with Sortea2 on Facebook Live is Lucia N.
But let’s go back to what perhaps is the only thing that drawn you here: Our giveaway! Reconnect with what matters most and fill your Galician days with once-in-a-lifetime experiences in Vigo and surroundings. Come prepared and do not forget to be open to surprises as cherished memories often begin as unplanned. Your Galician story will live on long after your getaway draws to a close, told through wide smiles, laughter, and excitement. 1 night stay in a guest room at one of the AHOSVI hotels including daily breakfast. A complete dinner in a renowned Vigo restaurant. A fun city to explore on your own terms! Ready to start creating Vigo memories of your own? Good luck! Giveaway closing date: Entries are accepted until August, 31th at 11:59 PM CET (August, 30th at 02:59 PM West US time). The winner will enjoy a stay for 2 people and one night in an AHOSVI (Vigo Hotels Association) member hotel. He or she will need to contact [email protected] to let them know the desired date to enjoy the prize. It is possible to propose a few different days in case the first choice is fully booked. The prize will be enjoyed from September, 1st 2017 to May, 31st 2018. AHOSVI will let the winner know the list of available hotels (2, 3 and 4-star hotels) and will let the winner know of the availability in advance in case they were all fully booked so the winner can pick another date. AHOSVI will designate the local restaurant where the winner and +1 will be able to enjoy a dinner for two people the same date of their stay. AHOSVI could give a few different alternatives for the winner to choose. The prize must be claimed at least 1 month before May, 31st 2018. Winners will be notified within 72 hours max. The winner must claim his/her prize before April, 30th 2018 or it will be forfeited. All entries must be received by the date and time specified. The winner will be picked at random and notified by email. The winner needs to be at least 18 years old. Entrants will be signed up to the A World to Travel’s newsletter to receive news and giveaway alerts. You can unsubscribe at any time, but it is a great idea to stay signed up to receive our latest articles and more giveaways to your inbox! All winner decisions are final, although if there are any irregularities the giveaway will take place again, selecting a second winner. Distribution of prize is the responsibility of AHOSVI. A World to Travel cannot be held responsible for lost prizes. Entry method: In order to take part in the giveaway, you need to sign up on the form above. When accepting the prize, the winner compromises to give his/her personal details for the different bookings associated with the same. The giveaway procedure and winner selection will be done automatically on A World to Travel. A World to Travel will communicate the winner to AHOSVI once the giveaway takes place and the winner is selected. Note: AHOSVI would highly appreciate the winner to publish a picture and caption with the hashtag #vigoexperience about his/her hotel stay and Vigo through some of his/her social media networks, mentioning the hotel and restaurant. This post was written in collaboration with AHOSVI – all opinions are my own. Thanks to Maruxa Eventos, AHOSVI, Marina Davila, A Chabola, The Hush Rock, Banyen Thai, El Bandoneón and all the local businesses involved in making #VigoExperience a complete success. Wow, what an incredible trip! Loving your photos and your video, thanks for sharing this inspiration! Galicia indeed looks and sounds like a paradise on earth. So many lovely experiences in one place. I am sure this is a great getaway for some incredible times. Oh you can’t believe how cool our homeland is! btw, you still have 24h to enter our giveaway. Good luck! Thanks for this contest. Galicia looks amazing. I’m living in Ireland right now and Spain is a popular holiday destination for people here, but I haven’t been to Galicia yet. Hopefully that will change soon. It’s amazing how many things you can do in Vigo. Going to relax at a spa, sailing, having tapas and socializing in the evening in a square would be my favorite things to do. I travel quite often to Spain but I didn’t get to Galicia yet. Hopefully soon! Vigo sounds fun, beautiful and delicious, definitely a city I’d like to visit in the future. Thank you for the giveaway! Thanks Samantha! Good luck if you entered our giveaway! Ohh what a great giveaway! I am tempted but we are saving up for our long term travel that starts next mai. But we might pass by Vigo! It looks amazing and a lot of fun! Then don’t forget to enter it! You still have 24 hours. What an amazing place! Galicia seems to be an excellent destination for travelers and foodies. Stunning photographs uncovered its real beauty. Thanks a lot for providing this giveaway opportunity. You rocks! Thank you Manoj! Hope you entered it and good luck! I would totally crash there. Such a beautiful place and it really encompasses the Spanish culture. Sailing and being near the water is one of my favourite things on holiday! This place truly does look like paradise! It does look like such a great experience out there. I love the islands and of course seeing everything from up above would be pretty incredible. You cannot believe how beautiful Cies islands are! My best friend lives in Vigo. I have been there only once couple of years ago and I loved it. Glad to hear that, Elena! Did you enter the giveaway? Good luck! This is such a beautiful place! Galicia seems to be a beautiful place for everyone I hope i can visit here someday. You are still on time to enter our giveaway 🙂 Good luck! I never knew of Vigo and thanks to your post for introducing this kind of beautiful place on my wishlist. Galicia looks like my kind of place as it has beautiful waters, culture and food. Thanks for stopping by! Did you enter the giveaway? Good luck if you did!